Photographic identification (Photo-ID) of all cetaceans encountered during our projects is part of our ongoing research effort. We pay special attention to capturing photographs of identifying features of the species (e.g. 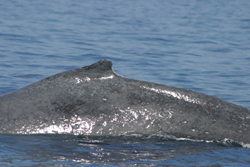 ventral fluke surface of humpback whales, or the dorsal fin of odontocetes). 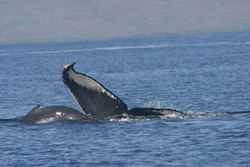 In 2005 we obtained 36 different identifiable fluke pictures of humpback whales. In addition, we obtained 7 “partial fluke” images and 15 dorsal fin shots, all of which could be matched to images in existing humpback whale photo-ID catalogs. Other cetaceans photographed included 2 small schools of bottle-nosed dolphins (Tursiops sp. 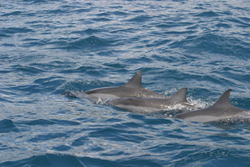 ), 5 small schools of Hawaiian spinner dolphins (Stenella longirostris longirostris) and one school of approximately 13 short-finned pilot whales (Globicephala macrorhynchus). Several usable photo-ID shots were taken of these groups. 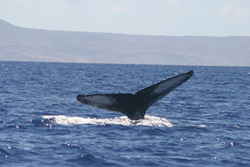 In 2006, we obtained 53 different identifiable fluke pictures of humpbacks, 5 “partial flukes”, and 34 dorsal fin shots. We also photographed 2 schools of Hawaiian spinner dolphins, (and unfortunately, missed a chance to photograph a tiger shark, while fleeing). All photographs are archived in a digital database held by Cetos. They are made available for use by other researchers and research groups. Humpback whale photographs are forwarded to the Hawaiian Islands Humpback Whale National Marine Sanctuary, for inclusion in the ongoing project known as SPLASH(Structure of Populations, Levels of Abundance and Status of Humpbacks), the most comprehensive study ever attempted of the endangered North Pacific humpback whale population. Humpback whale flukes also will go to the National Marine Mammal Laboratory in Seattle, which houses the North Pacific Humpback Fluke Data Base Catalogue. This database allows for humpback populations to be monitored, examines life history traits, abundance trends, and habitat use patterns. Photographs of other Pacific marine wildlife species, particularly the deeper diving species, will be contributed to ongoing photo-identification cataloging efforts such as those led by Dr. Robin Baird of Cascadia Research Collective.